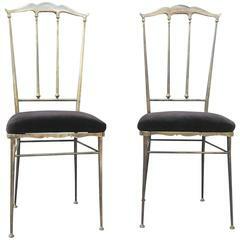 Pair of refined Italian Campanino Classic Chiavari chairs, circa 1950s. Massive brass upholstered with velvet and brown blond original Iceland wol. In very good condition. Pair of refined Italian Campanino Classic Chiavari chairs, circa 1950s. Maiive brass with upholstered with velvet and off-white Iceland Wol. Pair of refined Italian Campanino Classic Chiavari chairs, circa 1950s. Massive brass with upholstered with pink velvet. In very good condition. 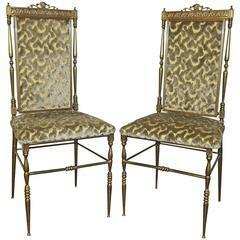 Pair of brass Italian chairs by Chiavari with the original fabric. Couples Chiavari chairs made ​​of brass, 1950. Seats with non-original velvet fabric, manufactured in Italy. 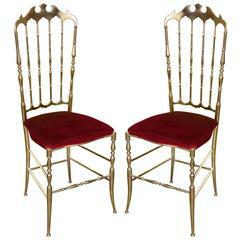 Pair of brass Italian Chiavari chairs. Pair of Chiavari neoclassic motif side chairs, newly upholstered in Zimmer Rohde cut velvet fabric. Tubular brass construction. 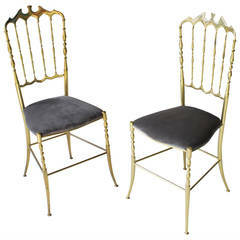 A pair of Chiavari brass chairs from the 1950s fully original. An attractive, timeless form. Perfect performance and very good condition.